Happy Friday! I hope you all had a good week. Things are settling back to normal around here and I made two French Fridays with Dorie recipes! 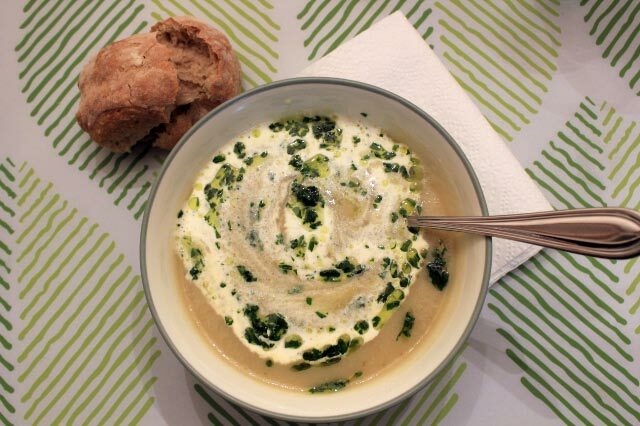 This week the group made Jerusalem Artichoke Soup with Parsley Coulis. You may be thinking that we just made something with Jerusalem artichokes. Well, yes we did, last month. Now that we are getting down to the last few dozen recipes from the book, we are being strategic about which recipes we do, to make sure we don’t miss certain ingredients when they are in season. Also, certain “odd” ingredients (like Jerusalem artichokes, for example) have been hard sells, and we are finally having to bite the bullet and make those recipes. So, two Jerusalem artichoke recipes in two months. 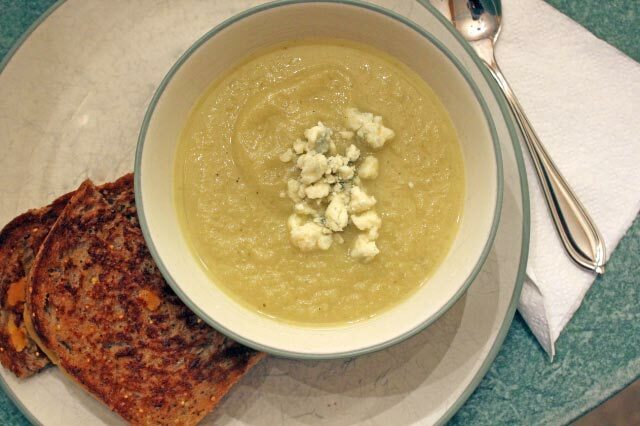 This soup was actually quite similar to the Celery-Celery Soup we made last month. Same techniques, just a variation in ingredients. This one had butter, two large onions, a bit of celery, on leek, garlic, Jerusalem artichokes, and chicken broth. We made a parsley coulis (parsley pureed with olive oil and salt) to drizzle over the finished soup. What a pleasant surprise! After the so-so results from the Celery-Celery Soup and the Roasted Jerusalem Artichokes, I didn’t have high expectations. 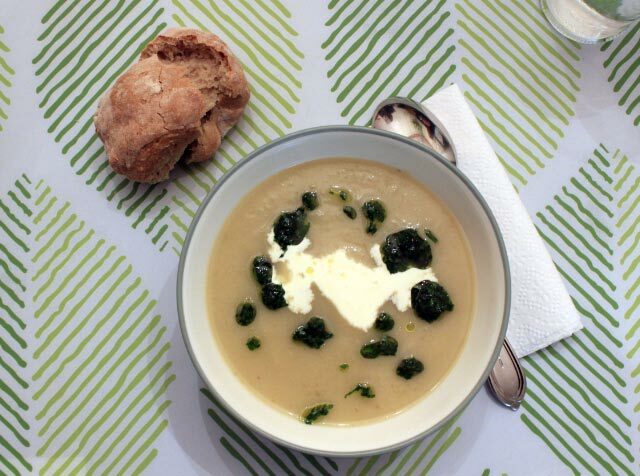 But Jerusalem Artichoke Soup had a lovely flavor that both my husband and I enjoyed very much. The parsley coulis and a dollop of heavy cream finished off the soup very nicely. This past week I also did a make-up recipe from way back when French Fridays first started: Marie-Hélène’s Apple Cake. This is a simple cake chock-full of apples. There are almost more apples than batter! Dorie recommends using four different kinds of apples, to get varying textures and flavors. I took her advice and I loved the results. She calls for four “large” apples, but I used one large and three that were smaller. Some people have had trouble having too many apples and not enough batter, and I feel that using a few smaller apples helped with this. Why did I wait so long to make this delicious cake? It’s easy enough to make at the spur of the moment, and a perfect way to enjoy apples at their peak. The touch of rum in the batter really added a nice flavor. I love simple cakes, and this one was a winner! 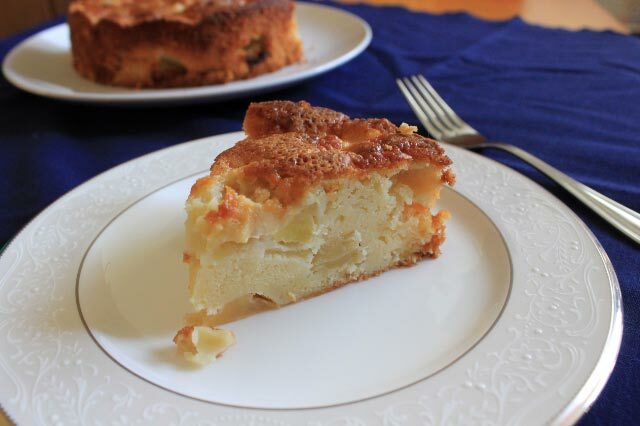 If you would like to try Marie-Hélène’s Apple Cake, you can find the recipe here. The recipe for the soup can be found in the book Around My French Table by Dorie Greenspan. Happy Halloween! Gosh, where did October go? I’ve talked a lot this year about being busy, but the rest of the year was just warm up for October. Whew! So what was I up to in October? The month started with a fun trip to Yosemite National Park. I hadn’t been since I was a toddler (many years ago!). Our weather was perfect and the scenery gorgeous! I haven’t had a chance to go through my photos yet, but once I do I will try to share a few. Last week my daughter had orthopedic surgery to address a leg length discrepancy. The surgery went well and she has bounced back quickly, but the preparation and after-care have taken a lot of time and energy. A child’s surgery is hard on the parents! The surgery was a couple hours away in Sacramento, so we’ve had a few trips back and forth, not to mention a hotel stay the night before. Lots of life happened between the vacation and the surgery: Appointments. A couple date nights. Plumbing problems. Etc. First we tried Celery-Celery Soup. The two celeries are: 1) celery root; and 2) celery stalks. The soup also includes onions, apples, thyme, and chicken broth. This soup was OK. It definitely tasted like celery! We liked it, but I wouldn’t make it again. In the photo above, I sprinkled some crumbled Gorgonzola cheese on my soup. It wasn’t as good as it sounds. I liked it better the night before with a little heavy cream stirred into it. The next October recipe was Monkfish and Double Carrots. I cooked this on strange equipment in a strange kitchen while on vacation at Yosemite. The carrots were the best part: Sliced carrots simmered in carrot juice with butter, olive oil, and rosemary. 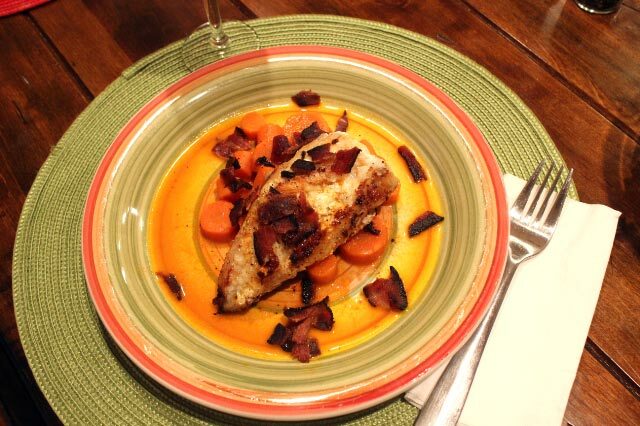 The monkfish was simply seared in a skillet until cooked through, served with the carrots, and scattered with crumbled bacon. I don’t feel like we got to fully enjoy the flavors of the monkfish. I am afraid I overcooked it a bit due to using a new-to-me stove and skillet. The carrots were delicious, and I can see myself making them on their own as a side dish. Next up: Roasted Jerusalem Artichokes with Garlic. I had only tried Jerusalem artichokes (also known as sunchokes) one time before this, and I don’t remember if I liked them or not. In this recipe, the artichokes are peeled and quartered lengthwise, then roasted with plenty of thinly sliced garlic. So, I liked this dish. It was fun to try, and the artichokes went well with the beef ribs I served them with. But, they were similar enough to potatoes that I wished they were potatoes. 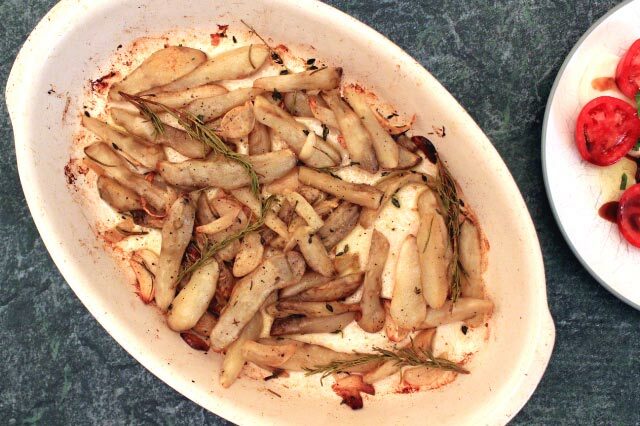 I think I will stick to potatoes from now on (although I may try roasting them with those tasty slices of garlic!). Last, but not least, we have Osso Buco à l’Arman. This is a French take on the classic Italian dish of braised veal shanks. What makes this version different is the addition of lots of orange zest and sliced carrots. I wanted to like this dish more than I did. The problem for me was the strong taste of orange zest. I loved the tender meat and the yummy veggies, but I wanted less orange flavor. If I make this again I would greatly reduce the amount of orange zest used. 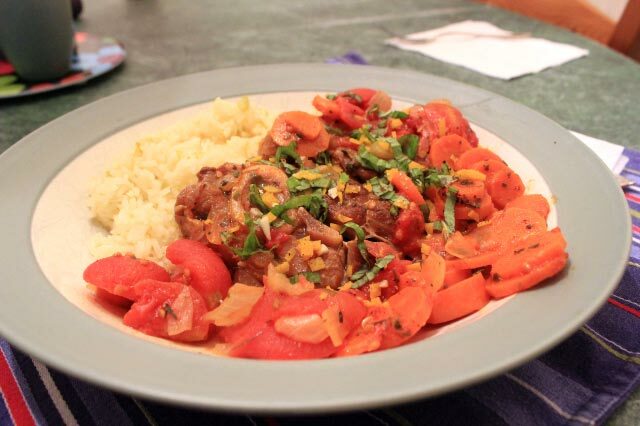 I served my osso buco with a delicious orange rice pilaf that I made in my rice cooker. The rice had a lovely, subtle, orange flavor and I will certainly make it again. Whew! I’m worn out after all that! I hope to catch up on my blog reading now that life is settling down. I haven’t even opened my blog reader in a month! I miss you all, and hope to keep up a bit better (of course, now the holiday season is right around the corner…).